Elsa's tiny digital TV tuner fits on an SD card. Not that it really matters, but any idea how much your digital telly set-top box weighs? Bet it's a fair chunk heavier than the latest Japanese terrestrial digital TV tuner, which weighs just 5g. Admittedly, the Telebit tuner is on an SD card, but that's an impressive feat of engineering on the part of maker Esla all the same. The ¥12,800 (£55) SDIO card receives broadcasts in the popular 1-seg format and will be on sale at the end of this month. Lest the Telebit fail to tune in, the pack includes a telescoping aerial, which can be extended by 1m using a cable that has a handy magnet at its base for attaching the antenna on, for example, the outside of a window frame. Naturally, the bundled software can handle electronic programme guides, scheduled recording and the ever-essential time shifting. 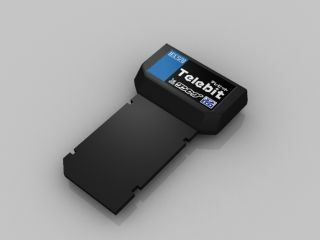 Sadly for non-residents, the Telebit will never make it outside Japan.